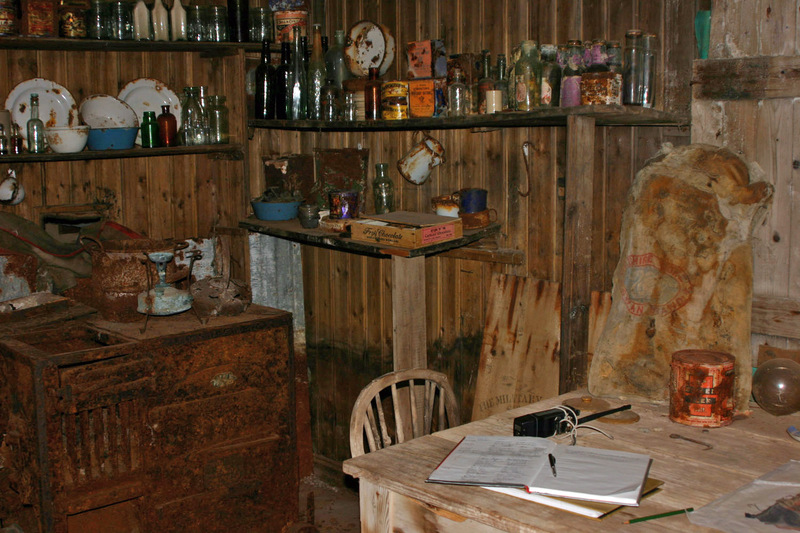 The hut of Carsten E. Borchgrevink, built during the British Antarctic Expedition 1898 - 1900 - ship - Southern Cross. The picture is of the interior of the accommodation hut in 2005, it is 5.5 x 6.5 metres (21 x 18 feet). This space had (has - it is still like this) 2 small rooms off the entrance porch and then a large communal room seen in this picture. Five sets of bunks beds around three of the walls gave each of the ten men a little privacy and sleeping space while the rest was available for all with the stove (brown and rusty in the picture) providing cooking facilities and also heating. The combination of nationalities and social positions would have made for somewhat uneasy relations at the best of times but were particularly difficult in these cramped conditions where weather conditions sometimes kept all of the men indoors for days on end. Many lessons on how to winter were learned however, some of them the hard way. Draughts made the hut cold to begin with, though these were dealt with which later led to near asphyxiation of some of the men from carbon monoxide poisoning as a result of the lack of ventilation. "May I never pass another 12 months in similar surroundings and conditions."